Food & Friends » Food & Friends Announces New Executive Chef, Alicia Mehr! Home > About Us > Food & Friends Announces New Executive Chef, Alicia Mehr! Food & Friends Announces New Executive Chef, Alicia Mehr! 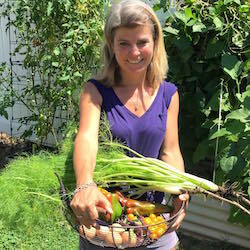 Food & Friends is thrilled to announce Alicia Mehr as our new Executive Chef! Alicia joined the Food & Friends kitchen in August 2017 and began her Executive Chef duties this past April. “In the approximately six months she has been with us, Alicia has demonstrated care and compassion for our clients, has developed relationships with staff and volunteers and has embraced the high standards of Food & Friends. We’re very happy to have her lead our kitchen and grocery operations,” said Carrie Stoltzfus, Deputy Executive Director, Programs & Public Funding. Alicia brings many unique experiences to Food & Friends. Having spent much of her career as a caterer, she has cooked for every president in the past two decades, as well as Supreme Court justices and members of Congress. Along with her husband, she founded Pete’s New Haven Style Apizza, which is named after her father. While her husband now runs the restaurants, her past management experience with the chain will be a great asset to her as Executive Chef here at Food & Friends, in addition to her cooking chops. Outside of work, Alicia, her husband and three kids have turned almost every inch of green space at their 16th Street Heights home into a highly productive urban garden. They grow every kind of vegetable, various fruits and berries, and even raise chickens. Alicia has kindly been sharing her fresh eggs with Food & Friends staff. Alicia follows in the footsteps of longtime Executive Chef Mark Locraft, who led our kitchen for nearly eight years. We will miss Mark’s dedication and passion, but are excited about the skills and experience Alicia brings to the table. Please join us in welcoming Alicia in her new role!